Andrew James Wollaston is a native of Lancaster County Pennsylvania with a background in education. He graduated from Temple University in 2013 with a bachelor’s degree in Secondary Education – Social Studies. In 2016, Andrew graduated from Temple University’s Beasley School of Law. 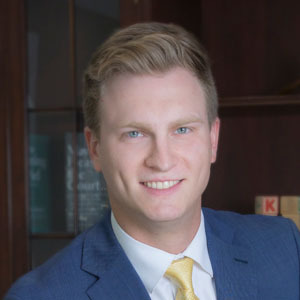 During his time in law school, Andrew interned with the Department of Education’s Civil Rights Division and the School District of Philadelphia’s General Counsel in the Labor/Employment Division. Andrew additionally interned with Philadelphia Legal Assistance, performing Unemployment Compensation service for indigent clients. These various experiences with students and parents drove Andrew to a career in Special Education Law. He has a dedication and desire to help those experiencing issues within both public and private school systems. As a former teacher in the Philadelphia School District, Andrew has the experience to understand and relate to the difficulties faced by those in a challenging educational environment. Andrew looks to focus his practice on the needs of Gifted Students. Andrew is an avid Philadelphia sports fan with interests ranging from motorcycle riding to visiting historical sites. He resides in Lancaster County with his wife and their Brittany, Riker. Temple University College of Education, B.A.